At very low temperatures and under strong magnetic fields, thin films of semiconducting materials can display a phenomenon known as the quantum Hall (QH) effect, which can allow electrons to flow with no energy loss. In a newly discovered class of materials known as topological insulators, the same state can be achieved without an external magnetic field, spurring interest in the development of low-power electronics and other promising applications. Researchers from the RIKEN Center for Emergent Matter Science, the University of Tokyo and Tohoku University in Japan have now experimentally mapped the relationship between the quantum anomalous Hall (QAH) effect in topological insulators and the well-known QH effect in semiconductors, which should facilitate the development of QAH-based technologies. According to Ryutaro Yoshimi from the research team, this is clear evidence that the quantization rules for both quantum Hall effects are the same and that they can be understood within the framework of the same quantized phenomenon. "This is quite a surprising finding because the origins of the QAH and QH effects are completely different," he notes. The team then plotted the conductivity data onto a two-dimensional map to determine the stable and unstable points of electron state flow in the quantized system. "The map gives us a way to immediately visualize if a material shows the QAH effect when cooled," says Yoshimi. "When we consider the universality of quantum conductivity in various materials, this map becomes quite useful." This result is due to Art Winfree's law of coupled periodic oscillators, which he proposed circa 1967. Winfree's law is best stated by Steve Strogatz in a SIAM obituary for Art. Periodic oscillators tend to coordinate the phases of their oscillations. When that occurs, only certain patterns of such coordination are possible. Planck's quantum of energy is a periodic oscillation. The most basic Winfree pattern is exactly anti-synchronous, or exactly opposed. 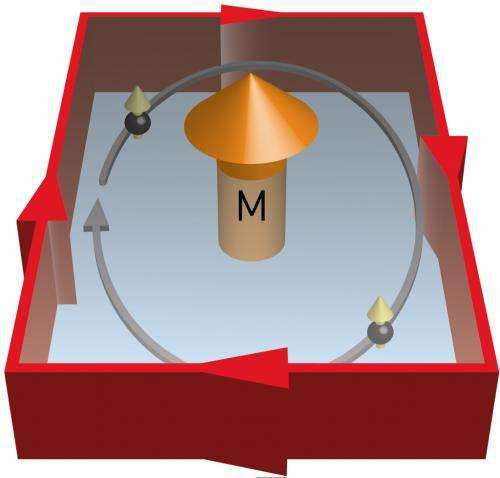 One manifestation is north south (here, magnetic alignment) opposed to east west (here, the ring). The result shown here is a classic Winfree result. Here, the surface two dimensional property of topological insulators makes this possible. The quantum Hall effect and the fractional QHE also result from Winfree's law, as do their mathematical descriptions, which center on Planck's h, a periodic oscillation. I have applied Winfree's law in posts to many other physorg articles over the last four years.